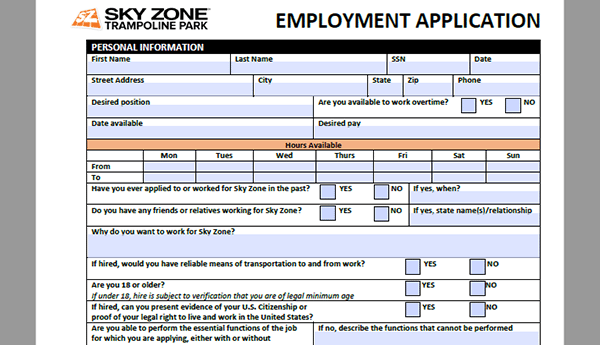 Download the official Sky Zone job application on this page. The application can be used to apply to any Sky Zone location. If you need help when you’re filling out the form refer the how-to guide posted in the below section for detailed instructions. It should be noted that because the business is franchise-based, the hiring process may differ from location to location. About the Company: Sky Zone is an American-based chain of family entertainment centers based out of Chesterfield, Missouri. The company was formed in 2008, and currently has franchise locations in numerous countries throughout the world. Step 1 – Press the button/link at the top of this page to download the official application form as a .PDF document. Step 2 – Once the document has been downloaded you can either print it out, or open it within a .PDF editing program (and fill it out on your computer). Have you ever applied to the company in the past? Can you present evidence of your U.S. citizenship/eligibility to work? Step 4 – On the second page (2) of the document complete the “employment history” subsections. Step 5 – On page three (3) of the form fill in the required details within the “References” section, and then initial/sign/date your name in the appropriate input fields.